The 25th Annual Week of Caring kicked off on Monday, June 19th and ran through Friday, June 23rd. Over 1800 volunteers from 48 businesses and organizations completed 201 projects across Northeast Tennessee. The financial impact of this year’s Regional Week of Caring was an astounding $260,712 for a cumulative 10,800 hours of volunteer work. 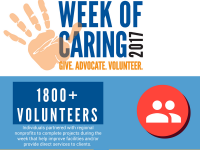 Week of Caring is an annual event during which volunteers across the region from local businesses and organizations demonstrate their care for our communities by partnering with nonprofits to complete projects during the week that improve facilities and/or provide direct services to clients. This year had 30 projects in Bristol, 6 in Carter County/Elizabethton, 151 in Greater Kingsport, and 14 in Washington County, TN. Participation in the Week of Caring builds company pride, understanding of community needs, and a renewed willingness to financially support local United Way campaigns. The Week of Caring has been a tradition since 1992. © United Way of Greater Kingsport. All Rights Reserved.